Ocean Trash is a modern day, scientifically documented Sea Monster. The photos are not fuzzy. Anyone with a camera can capture images of this beast on any beach around the world. Most Ocean Trash is plastic that never biodegrades, and it is killing wildlife and poisoning our food chain when it is consumed by aquatic creatures. "Most of the things we buy use disposable plastic: packaging, cosmetics, straws- even fishing nets. Many plastics are designed to be used only once, leading to our landfills and beaches being awash in these single-use plastic. We currently recover only 5-10% of the plastics we produce. 50% are buried in landfills and some are remade into durable goods, but much of it washes out to sea. Our ocean is a network of currents that circulate water around the world- called gyres. Hundreds of ocean species are threatened by plastic pollution, as well as the survival of the ocean itself. Humans depend on the ocean for food and as a healthy ecosystem that maintains the balance of the greenhouse gas CO2." The goal was to get the trash before it washed it the ocean. Was the battle successful? Take a look at these before and after photos. The numbers are also quite impressive: 63 Volunteers removed 550 pounds of trash before it was washed down Aliso Creek and onto our beaches and into the ocean after the first big rain of winter, otherwise known as the 'First Flush'. Included in the cleanup were 14 hypodermic needles, not something you want to encounter in the sand or on a swim. 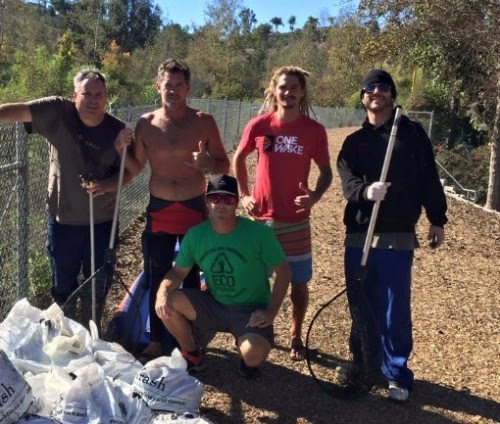 Pribram says, "GRATITUDE does not begin to express our appreciation to all of our volunteers and supporters, including OC Parks, The Ranch, REI, The YMCA of Laguna Niguel and Quiksilver." 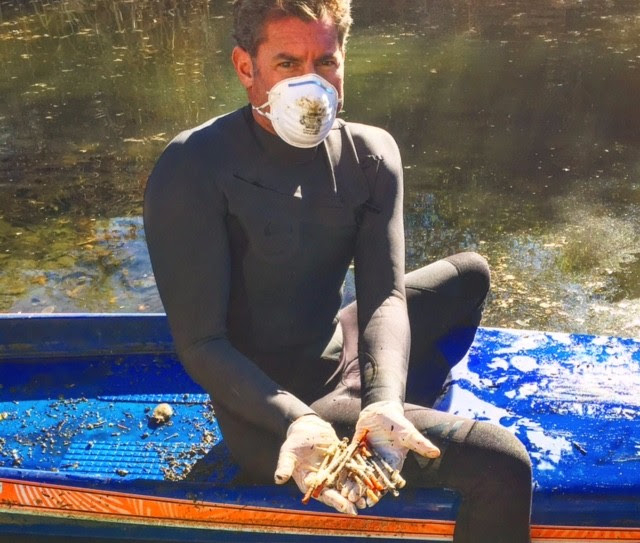 This is just the first of a series of upstream clean ups planned by Pribram, so follow his efforts on Facebook. These efforts are truly herculean and we all owe kudos to the volunteers. 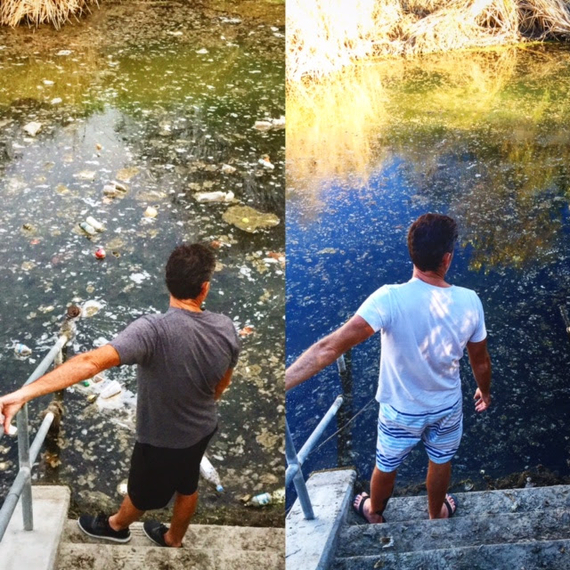 Even upstream cleanups, however large, cannot solve the problem of plastic pollution. They do wound the beast, and they provide us with very important scientific surveys on the nature of the beast. For example, every year on International Coastal Cleanup Day, the single largest volunteer event on the planet, valuable data from around the planet shows us that 8 of the top ten trash items found at the beaches around the globe are single use plastics. Check out the data from 2015 for a shocking portrait of the Plastic Sea Monster. To truly Slay the Sea Monster, we need to stop producing and using these wasteful single use plastics that we use for seconds to minutes although they last forever and are destroying our aquatic ecosystem and poisoning wildlife and ourselves. What can you do to Slay the Plastic Beast? 1. Educate Yourself: Join a Plastic Pollution Education and Advocacy Group like 5 Gyres or Plastic Pollution Coalition or Algalita Marine Research Foundation. 2. Join in Volunteer Efforts where you live to Clean Up, especially when they add to scientific data on the problem, like International Coastal Cleanup Day. 3. Stop Using Single Use Plastics. Start with the easy to avoid like plastic bags, plastic straws and plastic water bottles. Reusables are Cool and will save you money and improve your health and the health of the planet! 4. Support legislation from local to national to international to ban wasteful and dangerous single use plastics like bags, plastic microbeads in personal care products, plastic straws and plastic water bottles. 5. Go to the Beach and Enjoy the Gifts of our Blue Planet. As Jacques Cousteau said, we protect what we love.